Don't know what I was thinking - I can send these pages as an Email attachment. can sent them like that. Thank you for the personal message you have sent me, together with the above post. Please don't be annoyed, but what is in the story you are talking about? Is it the story of your evacuation? If so just download them on to the Glasgow Guide, just as you would if it was a photo you were putting on the Glasgow Guide. It will probably mean you have to give each page a different file name, then download them a few at a time. it wont accept that kind of document. It would be easier by Email, if you want it. I really enjoyed doing this ... Your story touched a lot of people. Danny. I thoroughly enjoyed your story. I was also evacuated but just to Bonawe House at Taynuilt. I don't remember much about it although I have been told that I was a menace for disappearing and on one occasion I somehow managed to lock myself in some kind of electricity shed. Fortunately for me I didn't touch anything. Now I know why my mother kept reins on me till I was a lot bigger. I am a bit late in getting back to you, but thank you for your kind comment, and thank you for taking the time to read my story. Like my younger brother, you would be too young to remember much about your evacuation days, but at least you do remember that life wasn't quite the same as living in a Glasgow tenement! If you hadn't been evacuated, you wouldn't have been in some kind of electricity shed, you would have been found 'raking the midden' for luckies, i.e. empty ginger bottles. They were always worth a ha'penny! Just a short, but very appreciative, note to thank Martin. Because of his website, I have been found by an old Canadian pal of mine whom I haven't seen since I left Canada 70 years ago! A Big thank you Martin. That's such good news, Danny. 70 years, I wonder if you have changed, . This just shows that these boards really work and how exciting it can be to meet again. I've just found my family that I haven't seen for 50 years. Hello Danny! Although I have been a member for many years on here, until today,I am sorry to say I had not read any of your evacuation story. However, I have made up for it and just read every word and this is to say, like everyone else, I enjoyed it greatly. There is nothing wrong with your memory pal. I noted that you sailed on the Rangitiki. My boss, when I worked for the Co-op back in the late 50s told me he was a butcher on the Rangitki throughout the war, so he possibly made your breakfast sausages! Another thing - I am sure you know the phrase, 'Once a Sapper, always a Sapper', and to read that you also were in the Corps was another co-incidence. I did my 'six' and could write a (small) book about the fun of blowing things up!. All the best Danny and I wish your stories were longer. Thanks. Danny - bring back memories? *Click to enlarge. Thank you very much for your kind post. 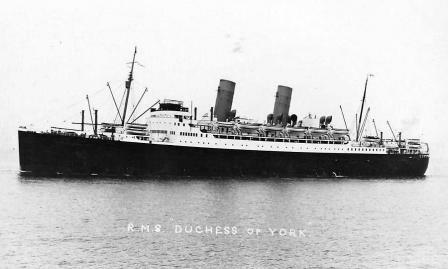 The lower photo of the Duchess of York brought back memories of the voyage to Canada. I remember standing towards the bow end of the ship watching a few of the sailors doing gun practice, for shooting at enemy aircraft. Thankfully no aircraft ever attacked us. This was a blessing because these merchant navy sailors were frinding it difficult to get things right - even they were laughing. Sadly some of them would have been on board when the ship was eventually destroyed by enemy action later in the war. It was a pleasant journey for me. Two to a cabin with steward attention. The trip back on the Rangatiki was different. 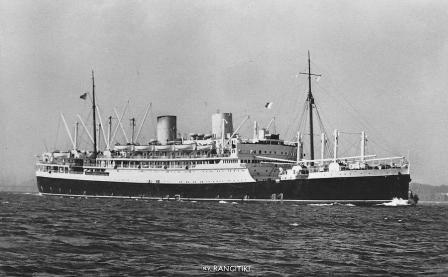 It was converted into a troop ship. We slept in a large area deep in the bowels of the ship, i camp beds. Salt water showers. It was interesting to hear that you knew somebody who sailed on her. He could tell you a few stories!